Yeah. I get behind on a series I’m already behind on. My goal is to try to get 10 episodes up at a time. This is mainly because as a daily drama, things tend to get drawn out so I think it should be okay to try in groups of 10 which may make these take even longer than they already are, but I will try to watch as much of Smile, Donghae in my spare time as possible to get these up as quickly as I can (although the currently airing dramas take precedence as I am trying to do better about not following behind on those like I did on all my 2010-2011 dramas). Donghae refuses to leave the hotel on his own volition as he’s done nothing wrong. He comes to a deal with Joon. He will leave after the cooking competition. Joon reluctantly agrees to this. The desperate Saewa demands to know why Donghae is leaving the station. He won’t tell her and she drags him off and repeats the question. What did he tell Joon? Donghae tells her to ask her father-in-law herself and shakes off her arm and leaves. Saewa rushes into Joon’s office and tells him that Donghae only spouts lies. Joon tells her to shut up and that he will be keeping this to himself to protect his wife and son. Saewa happily thanks him and tells her that Donghae will leave the hotel after the cooking competition. She tells him this isn’t good as Donghae is quite gifted and will succeed in winning the competition. He has to leave immediately. Joon then says he can’t interfere with hotel employees without telling his wife everything. Does Saewa want that? Sool Nyeo gets a huge shock when she arrives at the Lee house and find the Lakers back in Korea. She finds time to threaten Donghae, Anna, and Bongi while Pil Jae gives his son parenting advice—parents will do anything for their children you know. And that causes 1/2 the problems in some dramas. Bongi and Donghae try to reassure the frightened Anna that everything will be all right. Of course, Sae Young gets yelled at for not saying anything. How’s this her fault? Pil Jae questions Song Yi about a step-mother. She doesn’t want a woman like Sool Nyeo. How about Anna? No, because little Song Yi wants to marry Donghae oppa. LOL. So cute. Pil Jae then tells Song Yi to please try to treat Anna like a mother for his sake. Awwwwww. Sool Nyeo is shocked to learn that Saewa knew the Lakers are back. What is Saewa going to do about the cooking competition and Donghae working at the hotel. Saewa promises Sool Nyeo that she has a plan. She hangs up and Do Jin is standing right beside. Her. What isn’t she going to let happen? Saewa says it’s not a big deal and hugs him. She loves being in his arms and listening to his heart beat. How about him? He feels the same way (gag me). Saewa then reminds him that he’s promised to be on her side no matter what happens and grins evily. HATEHATEHATE Saewa. Head Chef reveals he’s a judge and not a competitor. Recipes are due by the end of the week. Oh, and they are going out after work to celebrate Yoo Jin’s arrival. Yoo Jin again tries to get Donghae to enter the competition, but Donghae remains true to his current partner. Yoo Jin doesn’t think Donghae and Bongi have good chemistry to make food. This makes her angrier and angrier and Dongahe is usually on the receiving end. Meanwhile, Anna convinces Sun Ok to take her to the Kim house to help out with her cleaning duties. Saewa runs into Donghae and Bongi and acts all cocky and happy. Donghae tries to keep Bongi from flaring up at Saewa. She’s no one to the two after all. She then goes to Hye Sook’s office and tries to get Joon to let her do the cooking competition tryouts. Do Jin and Hye Sook aren’t happy to hear of “reverse” discrimination being used on her and Joon has a hard time saying just why he’s doing it (it’s NOT because she’s his daughter-in-law). Meanwhile, at the party, Bongi starts drinking like crazy the more Yoo Jin flirts with Donghae. She even makes a fool out of herself in front of all her coworkers. In the end, Donghae has to piggyback the drunk girl home where she complains about him flirting with Yoo Jin. Sun Ok and Kang Jae return and the two hide together in Bongi’s bed as it will be bad for them to be caught together in her room alone at night. The two become very embarrassed under the covers and as soon as the coast is clear, Donghae springs out of the bed and leaves. He goes into his room where Anna presents him with the scarf she made. She’s also making matching scarves for her and James so they can take a family picture next time they meet. I am happy that Donghae is no longer getting horribly angry every time his mom mentions James. It’s nice to see him softening more towards his father. Meanwhile, Hye Sook is upset that Joon and Saewa are keeping things from her. Joon assures her its nothing, but Hye Sook doesn’t believe this and gives Saewa a warning. Yep. She’s going to be a bad mother-in-law. The next morning poor Bongi is horribly embarrassed recalling what happened the night before. What can she do? She then tries putting on bright red lipstick, but decides she’s better off as herself. Meanwhile, Songi goes to breakfast and sits in-between Anna and Donghae. Pil Jae scolds his daughter for having no pride. Enter the uncomfortable Bongi. 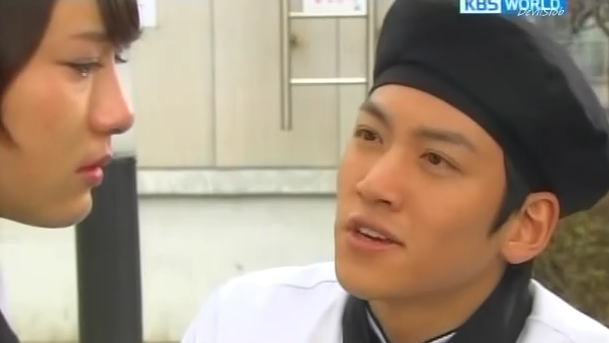 Sun Ok and Kang Jae compliment Donghae’s quickly improving Korean cooking skills. Anna then notices Songi starting at her. Why? Songi then reveals what Pil Jae said about Anna and Sool Nyeo and Anna wins over Sool Nyeo in the stepmother department. LOL. Pil Jae quickly leaves when he gets a call from the station. Got to love kids. Once outside, Pil Jae decides to make his confession to Anna at long last. While Bongi and Donghae worry over finalizing their recipe, Pil Jae goes to make his move on Anna and even daydreams about her happily accepting him. However, she’s not there. She’s with Sun Ok at the Kim house. Meanwhile, Tae Hoon and Sae Young foist the babies off on Sool Nyeo who quickly urges Pil Jae to come and help by bringing the babies’ forgotten blanket with him. Joon is surprised to see Saewa’s name still on the list of announcers to host the cooking program. He doesn’t like it, especially when he learns Saewa has gone to the hotel. He catches Saewa and Donghae together and is even more unhappy. Saewa explains that she’s professional and can do the job well. Can Joon trust her when she keeps going behind his back and doing all the things he tells her not to? Pil Jae arrives and Sool Nyeo does her best to wake the sleeping twins up so they cry and Pil Jae has no choice but to stay. The man is shocked. His wife took care of baby Song Yi, so he never even had to feed her or change her diapers. How horrible, but there are still a lot of men like that today. Meanwhile, Hye Sook finds Anna cleaning Joon’s study and is surprised to learn that Donghae’s mother is now working at their house. But she is pleased as she likes both mother and son. How long will that last once the truth is discovered? Donghae and Bongi decide to deliver their food based on their finalized recipe to Sae Young since it’s foods that are good for a woman who just gave birth. Pil Jae gets baby vomit on his pants and changes into Tae Hoon’s pajama bottoms while Sool Nyeo goes to clean them. Unfortunately the bell rings and Sool Nyeo has him hide in the bathroom. She’s not happy when Donghae and Bongi come in and then Sae Young and Tae Hoon arrive and Sae Young has to rush in to the bathroom to find Pil Jae and she screams. While cleaning Do Jin’s and Saewa’s room, Anna gets cut and Hye Sook rushes to her rescue. Anna apologizes for breaking Saewa’s picture and Hye Sook pauses. How does Anna know Saewa. Anna doesn’t know what to say since Saewa was Donghae’s ex-fiancée. But since Anna’s finger is really bleeding badly, Hye Sook drops the subject for the meantime and rushes to get a first aid kit. Joon wonders what happened and Hye Sook says one of the new maids broke some glass and cut her hand and rushes back out. Poor Pil Jae is caught without his pants and wearing only Tae Hoon’s pajama bottoms. Of course, everyone jumps to the wrong conclusion and Sool Nyeo uses this opportunity to exacerbate things by saying they’ve been “caught.” Poor Pil Jae tries to state this isn’t the case, but no one wishes to believe him. Bongi and Donghae leave and run into Saewa and Do Jin. What on earth are those two doing coming out of Saewa’s family’s place? Did Saewa forget they are related? Bongi and Donghae were bringing food to Sae Young to help her recover from giving birth. This gives Saewa an idea when she realizes this is the food the two will be using in the competition. Bad, bad, bad Saewa. This girl is sooo fake and so horrible at pretending things are fine that it’s a miracle so many people believe all her lies. She’s been so nervous of late how anyone doesn’t think anything’s up is really…unbelievable. Sun Ok comes to find Hye Sook patching up Anna’s finger and asking about how she knows Saewa once more. Sun Ok saves the day and says that Anna and Donghae appeared on a show hosted by Saewa to try to find Donghae’s father. This keeps both secrets safe (Donghae’s relationship with Saewa and Sun Ok’s relationship to Saewa’s family). As the two women go to leave, Hye Sook hands over their money which is quite a heftier sum than expected. As they leave, Joon comes out of the bedroom. This will get old fast. He and Anna keep JUST missing each other. Anna and Sun Ok stop by a florist so Anna could buy her favorite flowers to put in both the Lee and Kim house. They then arrive to hear Pil Jae trying to explain his innocence to Donghae and Bongi. Only no one believes him and Sun Ok gets really upset that in-laws are dating. Only they aren’t. Poor Pil Jae. Kang Jae even promises Sun Ok to have a good talk with his little brother. But not until after he teaches Bongi and Donghae how to make various types of kimchi for their competition. Hye Sook tells Saewa that she knows Saewa knows Dnoghae and Anna. Enter Do Jin and Hye Sook shuts up and leaves. 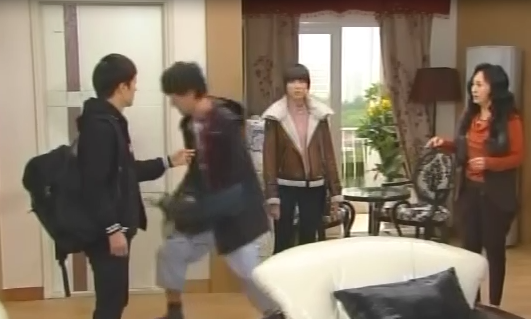 This has Saewa flying downstairs to demand to know how Joon could tell Hye Sook after he promised not to. This flummoxes Joon. Saewa can’t enter his study without permission. Plus, he never said anything to Hye Sook. Saewa is just making things worse and worse when it comes to her relationship with both her father and mother-in-laws. Enter Do Jin who starts getting angry at his father for what he believes is unfair treatment of Saewa. His wife assures him that there was a misunderstanding with Joon and things are all hunky dory. The next day Donghae and Bongi are rushing to the hotel as they are both running late. Enter Yoo Jin who offers them a ride. Donghae gets it and just as Bongi is about to, Yoo Jin takes off. Bongi is livid. Donghae is extremely unhappy and tells her to stop the car. Yoo Jin says her breaks are broken, but Donghae does get her to stop and he does get out. Bongi is still angry, though, and scolds both Yoo Jin and Donghae. Head Chef asks for their recipes. Sun Ae asks to turn hers in later. Looks like she still doesn’t have one. Meanwhile, Saewa overhears Sun Ae’s conversation and how she needs money to support her family. It also turns out that cutbacks to kitchen staff were postponed because of the competition. So Saewa decided to “help” Sun Ae out by giving her Donghae’s and Bongi’s recipe. Wow. Saewa is at an all time low. She knows how desperately Sun Ae needs to keep her job and by doing this, Saewa is completely throwing her under the bus. Kang Jae tries to talk to Pil Jae about Sool Nyeo. Pil Jae tries to assure his hyung of his innocence, but Kang Jae doesn’t believe him either. Pil Jae’s brilliant idea is to ask Sool Nyeo over to explain the situation. Unfortunately, this doesn’t go well as Sool Nyeo is delusional in thinking that Pil Jae likes her back and just makes the situation worse by talking about the movie date, the piggyback from the cemetery, and their drunken night. Poor Pil Jae is looking more and more like a bad guy the more he denies everything and the more Sool Nyeo plays herself up to be a victim. Anna arranges the flowers at the Kim house and then leaves with Sun Ok just as Joon arrives home. He comes in and immediately spots the flowers. Those are his precious Anna’s favorite flowers. Saewa notices him staring at them before he goes into his office where he recalls Anna talking about how freesias are her favorite flower. He then goes to his locked drawer and pulls out her picture which he stares at morosely. Enter Saewa with tea and he quickly hides the picture and harmonica. He complains about her not knocking first. Saewa said she did and apologizes again for the other day. Joon then angrily tells her to leave. Saewa puts her tea down and goes. She later sneaks back into his office and is floored to see a picture of Joon with Anna. Saewa flips out and steals the harmonica and picture and puts it in her purse just as Do Jin appears and wonders if she’s okay since she’s very pale and shaking. Saewa says that she thinks she’s coming down with a cold and immediately goes to bed. Meanwhile, the Lees are impressed with Donghae’s and Bongi’s increased cooking skills with their chosen recipes. They both feel confident that they can win the cooking competition. Saewa comes downstairs and sees Do Jin doing breakfast like she was supposed to. He takes off the apron and leaves her to finish up, but Hye Sook immediately scolds her for getting Do Jin to do what she was supposed to. It wasn’t like that, but Hye Sook seems determined to dislike Saewa at the moment. Hye Sook goes to get Joon and sees him looking for something. What? Joon won’t tell, it’s just that something’s been misplaced. After Hye Sook assures him the housekeepers have stayed out of his study, he immediately suspects Saewa. Bongi and Donghae leave to the well-wishes of the Lee family and Anna. Pil Jae offers to take Anna to the hotel for the competition, but Sun Ok doesn’t like this idea. She and Anna will go together after work. Meanwhile, Sool Nyeo plays the innocent victim and makes Tae Hoon bring her porridge. Tae Hoon says she should do this for him since the shock is so great. Sool Nyeo hopes he would be on her side since Sae Young and he dated in secret for quite a while before their relationship (and pregnancy) was exposed. However, Tae Hoon doesn’t believe the situations are the same. He then is forced to call his family and tell them about Sool Nyeo’s condition which again makes Pil Jae the bad guy. Poor guy. Meanwhile Hye Sook is angry at Saewa and when Do Jin tries to defend his wife, Hye Sook says its unwise to take your wife’s side over your parents. Joon gets up and leaves and Hye Sook gets up and tells her daughter-in-law to quickly guard her health if she wants to get pregnant. Do Jin encourages her to get some rest, but Saewa has things she needs to do. He asks her to come to the hotel later, and Saewa agrees and then asks when his father was in New York. Do Jin doesn’t know. Why doesn’t Saewa just ask Joon? Oh, no. She can’t do that. The kitchen staff are busy prepping for the competition and Bongi takes Yoo Jin aside. They are rivals in love after all and must have such conversations. Enter Donghae and Bongi quickly says its only girl talk and takes him out to prepare. The fact that two teams entered the exact same recipes is brought to the hotel’s attention. Head Chef decides to give them another chance by having them use the exact same ingredients to prepare a new recipe. This stuns Donghae and Bongi. Sun Ae remains firm that she didn’t steal anything, but Bongi and Donghae definitely know different. Donghae comforts Bongi (whose fingers and hands are a mess from all the practice) saying they can do it. Pil Jae goes to visit Sool Nyeo who plays up her misery and Tae Hoon manages to walk in on Pil Jae being pinned by Sool Nyeo so this makes Tae Hoon even MORE unhappy and unable to believe his uncle. Meanwhile, Saewa visits Anna with the picture and Anna confirms it was James. Saewa then leaves and Anna chases after her before fainting. Pil Jae happens to come at this time and saves her. He thinks Anna must be feeling unwell as she keeps insisting Saewa came with a picture of James. Thus Pil Jae takes her to the competition. Joon’s on his way there, too. Saewa gets into a fender bender with a light pole on the way, but comes to and quickly heads off to the hotel to stop Joon from meeting Anna. How come no one reported the accident…? She was knocked out for some time, too. Saewa does successfully waylay him. She later goes to the competition where Bongi and Donghae work together well despite their huge handicap (though I swear it looks like both teams are preparing the same dishes even though they are supposed to be doing something new). Anna sees her and chases after her and Pil Jae chases after Anna. He apologizes to Saewa for Anna even though it’s Saewa who’s lying. Poor Anna. People are going to think she’s crazy on top of being slightly mentally disabled. Oh, and during this time, Tae Hoon and Sae Young are fighting. Sae Young is heading off to sign up for her classes for the following semester and Tae Hoon is left at home with the babies when he needs to study as well. Ah, these two, constantly bickering, but you know they really love each other—they just weren’t ready for parenthood and marriage. Donghae and Bongi barely pass the first round. When Sun Ae calls and pleads for Saewa’s help, Bongi overhears and grabs the phone and immediately bawls Saewa out. Of course, Saewa knows that she’ll be okay as Bongi has no proof and Sun Ae fears for her job too much to speak out. Meanwhile, Pil Jae brings Anna home and tells her to rest. He’ll even get her some medicine. Enter Sun Ok who’s heading off to work. Anna insists on going with her and tries to search Saewa’s room, but just can’t really bring herself to do it and ends up crying on the floor. Poor Anna. Bongi and Donghae celebrate their success and Yoo Jin reveals to Bongi that she’ll confess soon. On no! Bongi will have to confess before her as she can’t let Donghae be swayed. Meanwhile, Anna is folding napkins and Hye Sook notices her pale face. Anna says she’s fine and is working hard since her son is, too. Everyone arrives home and the Lees celebrate Donghae and Bongi’s passing the first round. Donghae notices his mother’s bad face and takes her to their room. She reveals what happened with Saewa. Donghae is more prone to believe that Saewa really did something, however, when he asks Pil Jae, the older man reveals what happened (to his knowledge) and Donghae becomes more worried. Ah, Sool Nyeo is trying to win Song Yi over with expensive gifts and is unhappy to learn Song Yi doesn’t really care for her at all. Saewa is also worried as Joon has noticed the missing items and suspected her. How can she put them back without him becoming more suspicious? She puts them in a different drawer. Joon does wonder if he did originally misplace them, but he does still think Saewa having taken them is a high possibility since they returned after he asked. Anna wakes up in the middle of the night calling out for his father and even running outside in the cold with no shoes on. Anna bawls and apologizes. It was only a dream this time. Saewa successfully prepared breakfast this time and Joon apologizes to her for suspecting her. This makes Saewa happy (but I don’t think Joon meant it at all). Hye Sook then comes in and his unhappy that the two seem to be keeping things from her still. Enter Do Jin who hears his mother scolding Saewa for not explaining things. Do Jin interferes and starts defending his wife and this makes Hye Sook angry so she leaves without breakfast. Saewa then tells him not to take sides in front of his parents as it’s not helping her. This makes Do Jin feel bad, but he’ll listen. Saewa goes to deliver handmade porridge to the angry Hye Sook when she comes across Donghae. He doesn’t confront her about the cooking competition fiasco, but about his mother instead. Enter Do Jin and that’s where this episode ends.